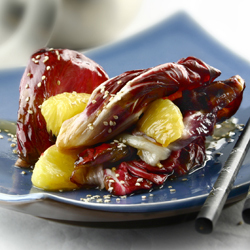 Gently sautéed radicchio fused with a warm asian ginger-orange dressing makes this warm salad a savory starter. Garnish with oranges or grapes to add extra sweetness. In large skillet over medium heat, sauté radicchio leaves in olive oil until radicchio is slightly limp, about 1 1/2 -2 minutes. Remove radicchio to large shallow bowl. Heat sesame oil over low heat in small saucepan; stir in ginger and garlic; whisk in orange juice, soy sauce, honey and dry mustard. Remove from heat; pour over sautéed radicchio and toss thoroughly. Serve immediately on salad plates garnished with toasted sesame seeds and oranges. This entry was posted in hot, radicchio, salad, superfood by admin.royalrose. Bookmark the permalink.